Guided Reading was absolutely foreign to me when I began teaching. Growing up, Guided Reading simply wasn’t something that was done in my elementary classrooms. So when I started teaching, I couldn’t draw on my own schooling experiences to help me. After countless Professional Developments, Meetings, Readings, and practice (I even recorded myself! ), I now feel confident in the way I can differentiate for my students’ needs! Keep reading to see how I maneuver through my lessons. If you don’t have it yet, hop LEAP over to Amazon to buy Jan Richardson’s book The Next Step Forward in Guided Reading. Not necessary, but her Teacher’s Companion also deserves all the praise hands. This book is an absolute Godsend. She gives you specific skills, word lists, comprehension strategies, word work sets, anything you’ve ever dreamt of having at your fingertips. My principal believes so much in this book that she bought every single teacher a copy of it at our school. It will become your sweet, sweet baby. Inside, she provides you with a lesson plan template. 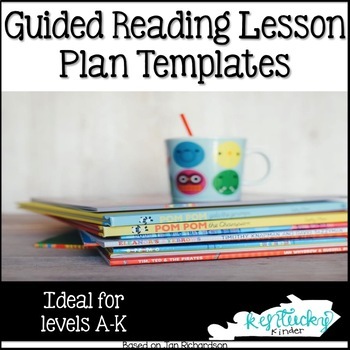 I created a modified version of the lesson plan that you can find in my Guided Reading Lessons Template. For the most part, the lesson plans are the same for each reading level but are differentiated to incorporate more sight word knowledge for lower levels and deeper comprehension for higher levels. Using this lesson plan, I am able to design my Guided Reading Lessons and know that I am going to hit every topic to ensure student success. I get my texts from Reading A-Z. This site is not free, but it is worth your school’s investment to get a subscription. Some schools might be able to print out sets of the books, however, I just print them on my own with the copier and store them with any accompanying plans and materials in a ziplock bag. What do they do when they get to your table? To transition to my small groups, I play “You’ve Got a Friend in Me.” My kiddos know that they have until the song is over to make their Daily Five choice and be at a level zero. Because it takes no time to look on the rotation board and see that a group is coming to me, my kiddos sit down and get right to work. I have sight word rings to the side of my table. These rings are differentiated by Kindergarten, Beginning of First, End of First, and Second Grade words. The kiddos know which color and row they are to be reading from so they grab their ring right away. If I make it to my table before the song ends, I will ask individual students if they are ready to read their words to me. If they are ready, they hand their cards to me and I begin flipping cards over. Kids have three seconds to read a word – I count self-corrections as being correct 🙂 If the child can read all of the words on the card, they are told to move on to the next set of rings. If a child says they are not ready to read to me, I simply move on to the next child. At the beginning of the year, all of my groups are checked on their ability to spell specific sight words. I have tried a variety of word lists, including the ones in Jan’s text, however, I use the one included in my Guided Reading templates because they correspond to the cards I use for my kiddos. This process goes FAST. It is not a time to teach the words, just to assess. I will repeat these words multiple times over the next several weeks. The goal is for kids to get around 6 checks on the same word in order to show mastery. During your introduction, you’ll also want to introduce any vocabulary or tricky words. Sometimes this means you have flashcards revealing the words, other times it means you’re asking the kids to generate a list of words they might encounter in the text. I also use this time to establish a purpose for reading the text. I will remind students of a particular strategy we’ve learned or I will remind them they will be expected to tell me about the characters, or about the setting, etc. During this time, the students are reading independently. Sometimes I give students specific pages to read to (Read to page 6, or Read to page 4). If a student makes it to the specific page before we are ready to talk as a group, students should go back to the beginning and read it again for fluency. What would look right? What would sound right? These are definitely not all of the teaching points, many times I use Jan’s suggestions and this year I am so excited to start using (link) my new Reading Strategies book! Why do you think the character ____? What is the setting of the text? Not every group needs this. I always teach sight words to my groups who are Level E and below. Using the sight word checklist I mentioned earlier, I teach new sight words. Ask students to use the word in a sentence. Together, look at the word on the card, say the SOUNDS of the word as the students write the letters on the table with their fingers. This helps to initiate the sensory part of the brain. I give my students little containers (from Dollar Tree) with the letters (Scrabble Letters or printed word tiles) of the word inside. The kids dump the letters out and mix and fix the word. They do this three times, always answering to me what the word is before mixing it up. Kids use a dry erase marker to write the word three times, always stretching the sounds as they do it. Using the suggested skills in Jan’s text, I do word work with my kids. This is a CRUCIAL component because it allows the kids to understand the way letters and sounds work together. I love to do Making Words with my kiddos. You can find my making words folder in my Guided Reading templates. Using this folder, my kids do word ladders by manipulating the sounds (again, I use a lot of the lists in Jan’s book). I know this does not explain every detail of Guided Reading but I hope it gives you a better understanding of the general structure of a Guided Reading lesson. What about you? How do you structure your Guided Reading time? Comment below and let me know!